Happy September!! For me…It’s Officially Fall!! I apologize if some of you are not ready to let Summer go but…to me, It’s FALL!! Do I sound excited? I am!! Time for Week In Review. When I went over to Clean Eats, Fast Feets to grab the link, I realized that Meghan had announced that it wouldn’t be until Tuesday. Well, due to the week ahead…I’m writing it for Monday and I’ll link up on Tuesday. I realize that some people probably want to have Labor Day off, but since I’m writing this on Sunday…doesn’t matter. I’ll link up whenever I need to. I just want to be invited to the party! Monday I had a dentist appointment. I had a cavity in one of my wisdom teeth! Now, come on guys…I’ve made it this long in my life with all of my wisdom teeth in tact and now I get a cavity in one?!?! Due to the nature of where the tooth is…We all know where are wisdom teeth are right? Way in the back, there is of lot of “Open Wide!” My dentist is wonderful, don’t really feel a thing, still hate the drilling sound. But having my jaw open that wide for that long left me with quite an ache in my jaw for a couple of days. It’s better now so I’ll stop complaining. Tuesday had us at Ralph’s routine cardiologist appointment. We love his doctor and don’t mind when we have to visit. Things are under control there. For a couple of reasons, I took my car to the mechanic to see if he could work on the air conditioning. End of August and you do this? Well, yes. Thought it would be Ok with a little freon. No such luck…needed a new compressor, but the good news was that it cost less than he originally quoted me. I’ve only recently started using this mechanic and he is a jewel! I feel like a slug because I haven’t gotten much accomplished in the way of projects. I do have a few donation boxes I need to get over to thrift shop in the coming week, just so I know they are no longer mine to worry about! I had hoped to hear from one of the antique shops regarding the photos I’d sent of things for sale but not yet. I’m going to shelf that in the back of my mind and try not to think about it right now. I need to focus on getting ready for The Trip! Yes, there are lists. 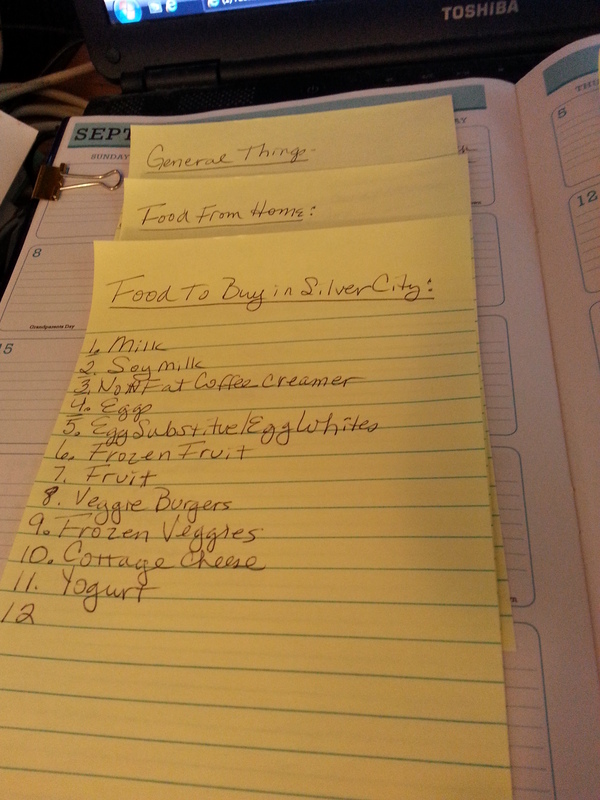 Lists don’t seem to work as well as I’d like them to in regular life, but when it comes to getting ready for one of our cross country jaunts, they are an amazing help. I have five separate lists…so far. There may be more. So far I have General, Personal Things, Household Items, Food to Bring With Us and Food To Buy once we’re there. Yes I have a shopping list for when we get there. I’ve been stocking up on non perishable things in order to spread out the cost and have some of the shopping out of the way. I did this because I know when I get there, I’m going to be drive-lagged…that’s like jet lagged only after a long car trip. As I plan things in my head, I know what I’ll need to buy. If I wait until I get there, I’ll be too foggy to think of what I need to buy. I hate to make repeated trips to get supplies when one trip will do it until we need to replenish. I didn’t do this for the last trip and I found myself scurrying around to get what I needed. I like this idea and I think this will make the Queen of Lists (Meghan@Clean Eats, Fast Feets) Very happy! Saturday at Weight Watchers, the inevitable happened. I had a gain. My eating had been a bit disjointed during the past week so I wasn’t too surprised. I’m still 15 pounds under goal so I’m not worrying. I’ll get back on track. Unrelated to the weight gain, I just feel better when I’m eating according to my routine. Saturday was also a tradition in our family…The Rock A Hula party. We all dress up in our Hawaiian shirts and celebrate Elvis and Cheryl, our beloved friend who was a huge Elvis fan. Along with Carrie, the hostess, we figured out that we’ve been doing the party for 8 years. Pretty cool! There is a LOT to do around here in the next week or so. I’d better end my review and get myself in gear doing what needs doing! Be sure to check out Week In Review on Clean Eats, Fast Feets tomorrow. This entry was posted in Uncategorized and tagged Week In Review, Weight Watchers. Bookmark the permalink. You’re so organized! And I’m sure you’ll have a loss next week 🙂 I’m also considering it fall even though it’s 90 degrees here! Oh, Liz, I’m so glad you’re on the Fall bandwagon with me! Yesterday, I actually started contemplating taking some Fall decorations with me to NM to decorate out there. We’ll be there for a month and I have so many I could leave them there. I would be so excited. Just can’t tell Ralph. I’ll have to hide them in my underwear!! So many lists!!! I feel better when I eat with a plan too but I tend to deviate when I’m on vacation and I am certainly okay with that 🙂 Hope you’re having a wonderful holiday! I’ve got so many things to remember for this trip, Davida, that’s why the lists are mandatory. I’m rarely that organized otherwise! Have a great week! love the recap, and the LISTS!! the hula party was so much fun. i’m glad i was able to make it this year. i’ll be thinking about you ’til we catch up again. Thanks, Sweetie! Knew you’d like my lists! So glad you come come to the hula party too! I’ll be in touch! You are right. 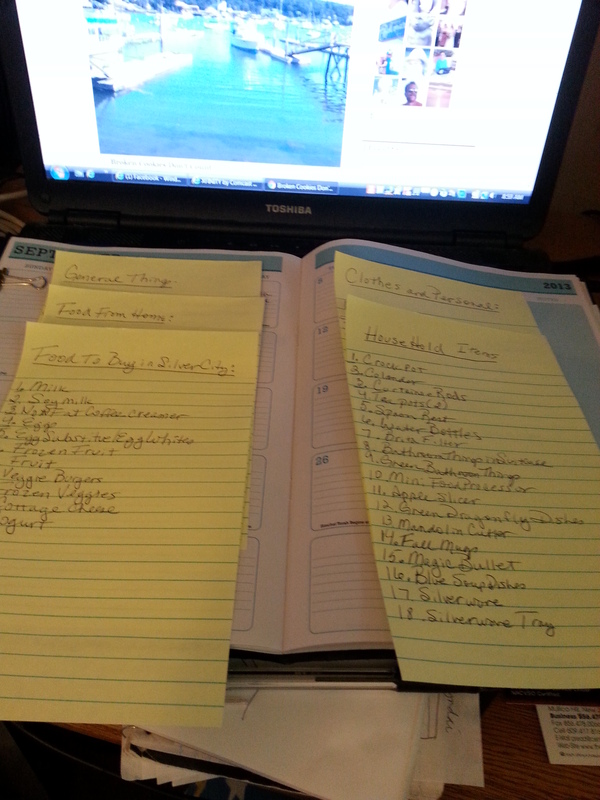 I love all the getting prepared for the trip lists. They sure do work, and I’m glad your doctor appointments (Ralph’s) went well. Thanks, Meghan. Actually he had a procedure today, but all is well…Hooray!! I’m glad it went well today. “Procedures” can be stressful little things. Interestingly enough and on a related note, I learned today that when you are stressed it causes a chemical reaction in your body, which actually makes your body hang onto fat. Maybe your very minimal weight gain was related to that. Not that you are or should be concerned because you’re still way under your goal weight!! That’s good info, Meghan. There was significant stress involved in all of this, but I’m so happy all is well. Thanks for your support, Sweetie. I never thought I’d be below goal at all, let alone this far so I’m just going to work on staying here. Have a great day! Thanks, Sarah! We’re very relieved. The party is always fun!